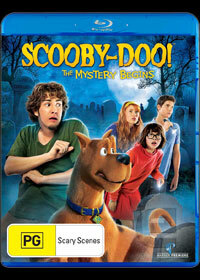 This made for TV movie may not star the original cast of the original live action film but it’s actually a refreshing look at the Scooby gang in this prequel entitled Scooby Doo the Mystery Begins. The story begins of how the Scooby gang met which is at Coolsville High and even though they did not know each other then, they are “framed” for staging a practical joke at the school, of course involving ghosts and they are suspended as a result. This then brings the gang together, except for Scooby who has been taken to a local animal shelter due to his size and somehow he finds where Shaggy lives and from there, a strong friendship is formed. Together, Fred, Shaggy, Velma, Daphne and Scooby begin investigating the mystery of their school and this is where the fun and action begins in this entertaining film about ghosts, comedy and some really strange quirkiness. Best of all, the actors in the series are almost perfectly cast, especially Nick Palatas as Shaggy, Hayley Kiyoko as Velma, Kate Melton as Daphe and Robbie Amell as Fred. The voice of Scooby which is hilarious is performed by Frank Welker who really gets into the character. The only downside of the movie, slightly, is the computer special effects of Scooby, however for a made for TV film, it’s still quite acceptable. Match that with a Dolby Digital 5.1 surround sound track, a glorious and colourful widescreen presentation and Scooby Doo! The Mystery Begins is a rather well made and fun movie and dare I say it, even better than the original live action film. Add in some fun special features such as a behind the scenes featurette and even a music video name to name a few of the extras and it’s a fun way to finish the film. Recommended for the entire family!